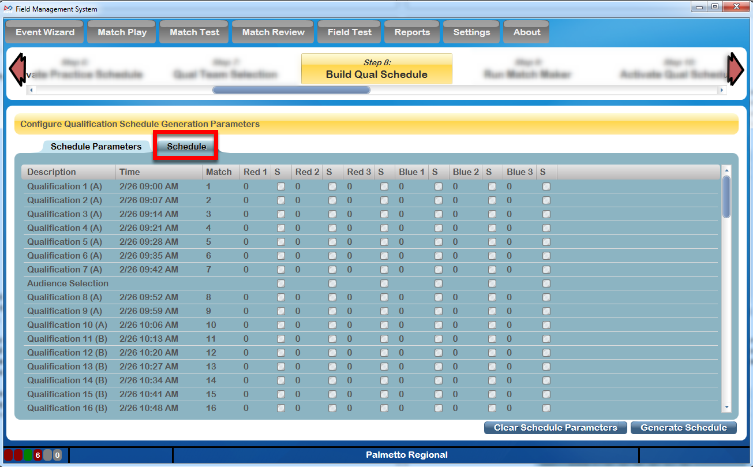 Tournament Levels are configured and managed in the build steps of the Event Wizard. 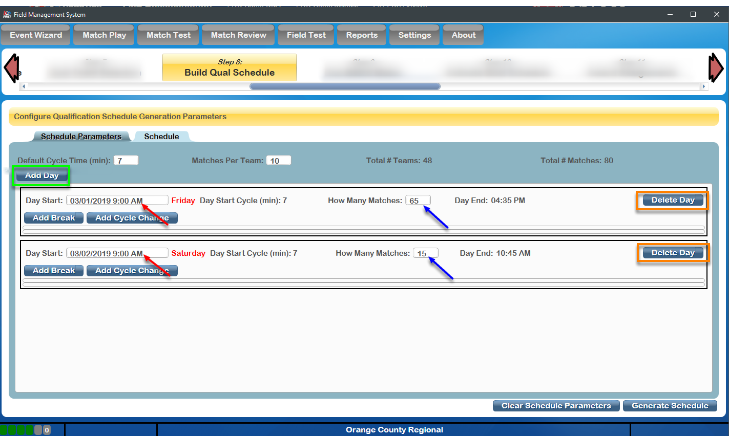 This step is used to setup the start and stop times for the Day(s), the lunch period, number of matches per team, and match duration. In our example steps, we'll be building a two day qualification tournament. Once the level parameters have been defined, days must be added. A Day should be added for each day on which matches will be played for that tournament level (normally one day for practice, two for qualifications and one for playoffs). Use the button marked in Green to add the number of days necessary to the list. If necessary, a Day (and any associated breaks) can be deleted by using the Orange marked button. [Red] Confirm the start date and time for each day of the level. The day of the week is displayed in red next to the box, and is used to confirm the schedule day is entered correctly. To the right of the break length the start time will be displayed based on the data entered (i.e. if the event remains on schedule, the break will start at that time). [Blue] The change that will happen. Negative numbers will make the cycle "faster" while positive numbers will make the cycle "slower"
To the right of the cycle change details will confirm when the change will take place, relative to the event schedule. 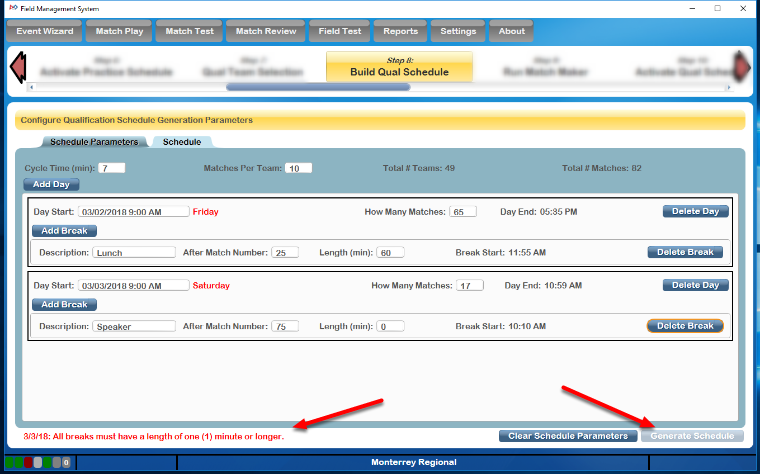 If any data entered is not valid, a message will appear on the bottom left and the Generate Schedule button will become disabled. The validation message will contain the date (when applicable) followed by the message text. All validation errors must be corrected before a schedule can be generated. 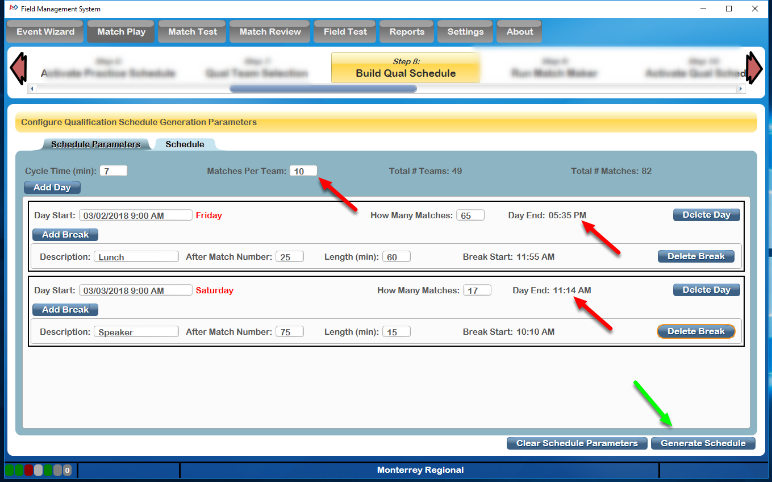 Before generating the schedule, confirm all data is accurate as displayed. Particularly those items indicated with red arrows, which are most critical to event schedule. If the event has a Regional Director (RD) or show manager, the schedule should be reviewed with them as well. If all information is accurate, click the Generate Schedule button marked with the Green arrow. While generating, the screen will turn gray and the "busy" indicator will show on the bottom right. A confirmation dialog will appear when the process completes. 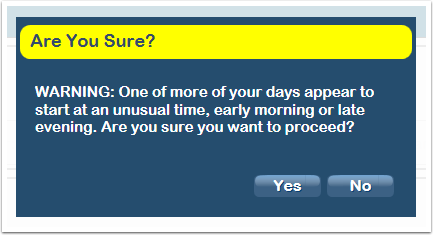 Messages may appear to provide warning about elements of the schedule, and off Yes/No selections before continuing to generate the schedule. In the example below, we've accidentally attempted to create a schedule that starts at 9:00 PM instead of 9:00 AM. We could still go with 9:00 PM if we wish by selecting Yes, or selecting No to go back and make a correction. 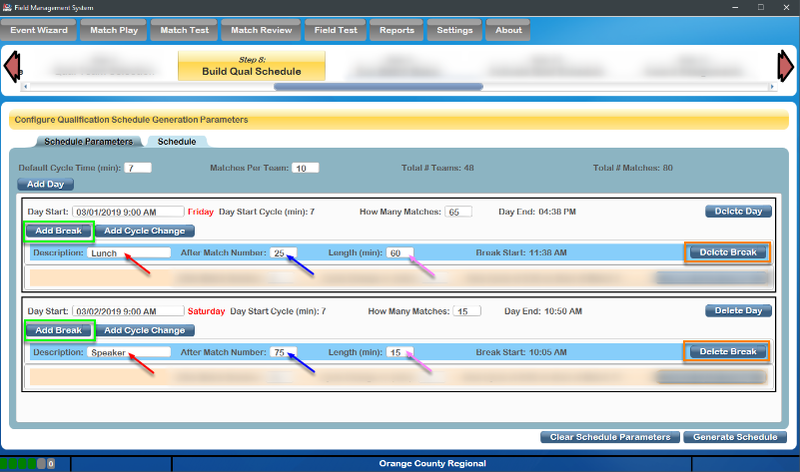 After generation, clicking the "Schedule" tab (marked with a red box) will present the full schedule based on the parameters that were supplied. This schedule should again be reviewed for accuracy with any appropriate parties. 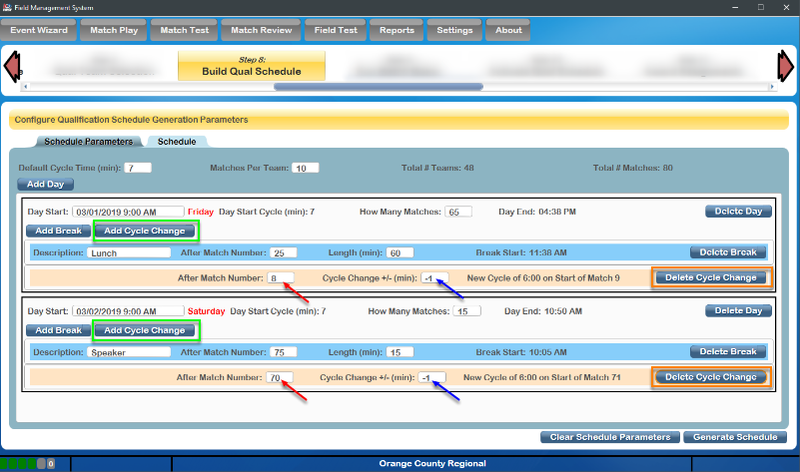 Breaks/changes cannot be made later without redoing other steps (such as Match Maker) or losing match progress (if matches have been played) so it is important to have the schedule be accurate from the start. Note that these times are fixed and will not update, “The Schedule is The Schedule” so to speak. The goal should be to play as close to the original published schedule as possible, without getting more than 4-5 minutes ahead. The timer on the bottom bar (see here) will display ahead/behind information. It is recommended to not get too far ahead regardless of how well things are going as this can be confusing to teams, as well as parents, VIPs, sponsors, etc. who show up to see a particular team compete only to find out the match was played early. Once the Alliance Selection has been completed, the next step in the Event Wizard is to configure the Playoff Tournament. In order to generate a Playoff Schedule, alliance selection must be complete. If it is not,an error message will be presented saying to complete the alliance selection process. The FMS software will only populate the quarterfinal matches (or octofinals/semifinals for other size tournaments) initially in Playoffs. As alliances advance in the Playoff Tournament the software will automatically populate the next round as teams advance from the prior rounds.